Every breed has health issues that plague them. As well, for every line there may be concerns. 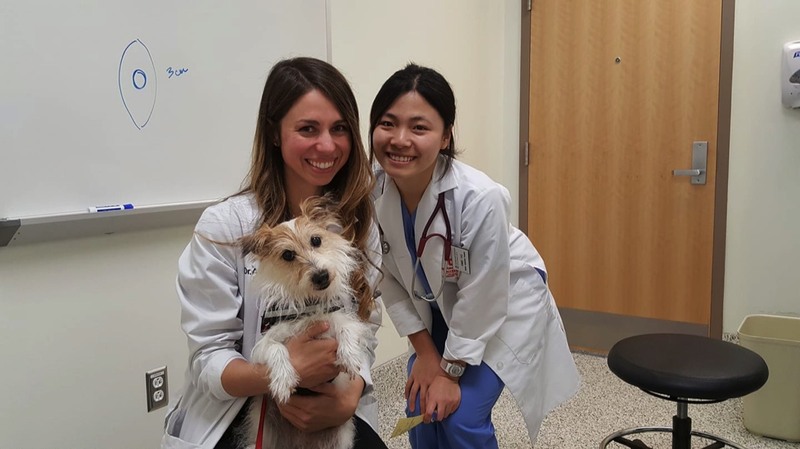 Here we talk about Jack Russell Terriers and common health issues in the Jack Russell Terrier as a breed. A little about coat color too. Absence of premolars: May be missing one or more pre-molars. This can be determined with an exam. Aggressiveness: Excessively assertive or forceful with other dogs or people, may attack or bite without reasonable provocation. Don’t let anyone tell you this is not hereditary/genetic. Temperaments can be evaluated - We will not breed a dog who is "high game" or aggressive towards humans. Autoimmune Disease: This is a very broad term - and requires a “trigger” - as in an event that starts the disease process. The trigger/cause will be a stress factor as in; overuse of vaccines, antibiotics or steroid drugs, exposure, emotional distress, environmental pollutants, food preservatives such as ethoxyquin, chemicals found in pesticides, chemical flea and tick treatments, etc. Not much is known about what the root cause is, but there is a possibility genetics play a role, causing the dog to be more susceptible... but this has not been proven yet. - There is presently no way to test for an underlying/dormant autoimmune disease - not until a dog is affected by it. Canine Hyperuricosuria: This causes elevated levels of uric acid in the urine. This trait predisposes dogs to form stones in their bladders or kidneys. These stones often must be removed surgically and can be difficult to treat. Hyperuricosuria is inherited as a simple autosomal recessive trait. A DNA test for this specific mutation can determine if dogs are normal or if they carry one or two copies of the mutation. Dogs that carry two copies of the mutation will be affected and susceptible to develop bladder/kidney stones and should never be bred. - Our Jack Russell Terriers have tested clear. Cardiomyopathy: Abnormality of the heart muscle, can result in lung edema (water in the lung), weakness during exercise, and sudden death. Cerebellar Ataxia: A neurological disorder resulting from degeneration of the cerebellum's cortex. Our Jack Russell Terriers have tested clear. Cushing’s Disease: There are two different distinct forms of this disease. It is basically the generation of far too many hormones from the adrenal glands, giving rise to many ailments. Deafness: Partial or total hearing loss in one or both ears. This can be tested for (BAER test) - Our breeding Jack Russell Terriers have all tested clear. All puppies that do not pass initial screenings will be BAER tested before going to new homes. Distichiasis and Trichiasis: Deformity or abnormal placement of eyelashes on eyelid. This can be easily determined with an exam. None of our Jack Russell Terriers have this issue. Growth Hormone Deficiency: Lack of production of or inability to use growth hormone. Causes dwarfism. Hemophilia B: A hereditary blood coagulation disorder common in terriers. This can be tested for - Our Jack Russell Terriers have tested clear. Hyperuricosuria: This is a medical term referring to the presence of excessive amounts of uric acid in the urine. This can lead to bladder stones, and less frequently kidney stones. The disease is inherited as an autosomal recessive trait. Our Jack Russell Terriers have tested clear. Legg-Calve-Perthes Disease: A septic necrosis, or degeneration of the head of the femur. Usually doesn't manifest itself until a puppy is at least six months old, and can result in progressive rear-leg lameness. None of our Jack Russell Terriers or their offspring have had this condition. Liver Shunt: Common in small terrier breeds and all toy breeds. Some can be corrected with surgery. Patellar Luxation: Poor development of structures holding knee cap in place. “Loose Knees”. Can be mild and on occasion or severe and often. This can be checked for by Veterinarian. - All of our Jack Russell Terriers are in the normal range and are re-checked again every year. Microphthalmia: Condition that occurs when a dog's eyeballs are smaller than normal, restricting vision. The internal structures of the eye are sometimes abnormal as well. Microphthalmia is inherited in many dog breeds through recessive genes. Owners of affected dogs will notice that their eyeballs appear smaller than normal for the animal's breed, and there may also be noticeable signs of visual impairment. In fact, most dogs with the problem are either born blind, or else eventually become blind or severely visually handicapped. White dogs, Piebalds and Merle color breeds are more likely to inherit this condition. We had a pup with this condition so the mother was removed from our breeding program. 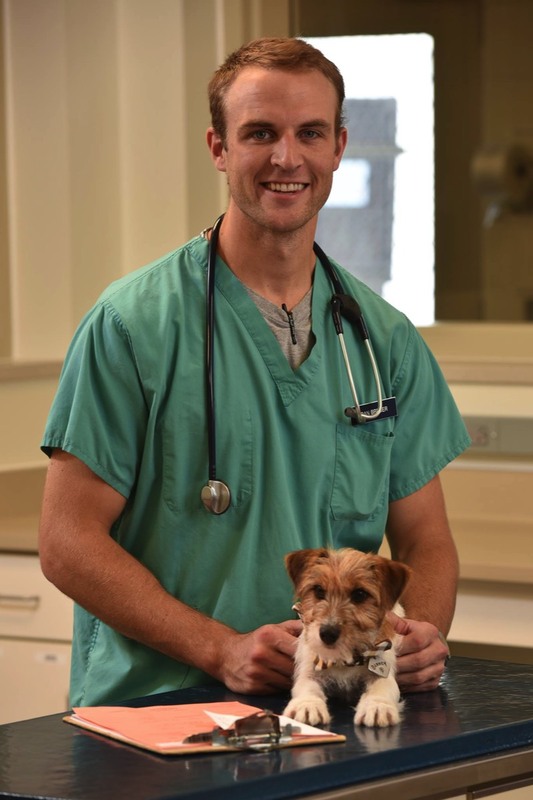 Pancreatitis: Any dog or breed can suffer from this. A more recent study suggested that pancreatitis may occur more in some breeds than others. The JRT was listed as one of the breeds who may possibly be predisposed to it. Know the symptoms and ways you may be able to prevent it. There is currently no DNA test available to pre-screen. Primary Lens Luxation: Primary Lens Luxation (PLL) is a well-recognized, painful and blinding inherited eye condition that affects many breeds of dog, particularly terrier and terrier-type breeds. In affected dogs the zonular fibres which support the lens, breakdown or disintegrate, causing the lens to fall into the wrong position within the eye. If the lens falls into the anterior chamber of the eye glaucoma and loss of vision can quickly result. The DNA from each of our breeding terriers has been analyzed (and cleared) for the presence of this mutation gene. We do not breed carriers. In reference to PLL testing: If a jack russell terrier breeder is using terriers who are CARRIERS of PLL, this means the dog has one copy of the PLL gene. Science has already proven that a carrier has up to a 20% chance of coming down with PLL - a blinding and painful condition. Fact: The Punnett square tells us the PLL carrier dog will in all likelihood produce 50% carriers like itself …and 2-20% of those pups will go blind too. Some breeders will also tell you that PLL is not a life threatening disease…This is a disturbing statement as PLL is a very painful and long suffering disease. Don’t let them con you into the purchase of a puppy from a PLL parent unless you have documentation that the puppy does NOT carry the PLL gene. Dwarfism: Underdevelopment of the body. May be the result of a developmental anomaly, of nutritional or hormone deficiencies, or of other diseases. Cretinism: Rare birth defect when brain does not produce enough thyroid-releasing hormone or the pituitary gland at the base of the brain does not produce enough thyroid-stimulating hormone. Achondroplasia: A failure of growth of cartilage in the young, leading to a type of dwarfism. Chondrodysplasia: Abnormal growth of cartilage. Causes disproportionate dwarfism and occurs as an inherited trait. Progressive Neuronal Abiotrophy: Progressive neuronal abiotrophy (or ataxia) causes tremors and a lack of coordination in dogs and is caused by degeneration of the cerebellum's cortex responsible for coordinating movements. Radial Agenesis: Radius stops growing sooner than the ulna causing severely bowed front legs. This can be a crippling condition. Terriers with this condition may suffer from early onset arthritis. It is something that can be corrected by carefully choosing proper mating partners. Retinal Dystrophy: Causes blindness in terriers. Our Jack Russell Terriers have tested clear. Severe Combined Immunodeficiency Disease: SCID is a severe form of heritable immunodeficiency and common in Jack Russell’s. Our Jack Russell Terriers have tested clear. Spinocerebellar Ataxia (SCA): This condition occurs when the cerebellum cannot coordinate movement, the dog can move, but the movement is poorly coordinated. There appear to be at least two (probably three) different forms of cerebellar ataxia in Jack Russell lines, a neonatal cerebellar ataxia and a later onset of ataxia (spinocerebellar ataxia or SCA) with or without myokymia or seizures. Our Jack Russell Terriers have tested clear. Tracheal Collapse or Hypoplasia: Can cause mild to severe breathing problems. Von Willebrand's Disease: Genetic bleeding disorder that occurs in dogs. In fact, it is not a single disease, but a family of related diseases of variable severity. Our Jack Russell Terriers have tested clear. Our Jack Russell Terriers have had extensive genetic health testing done. You may read more about this in our DNA PROFILING section. This is part of our screening process when determining if a dog will be used for breeding. 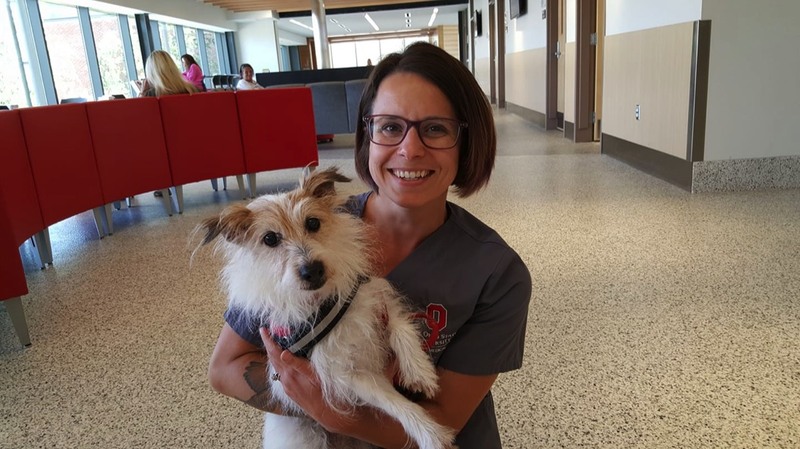 If a website says: “We Tealth Test”…and then you don’t see a page devoted to health testing, or OFA numbers assigned to the terriers, or more information with a LIST of tests - then ASK QUESTIONS AND FIND OUT WHAT THAT MEANS. Chances are, they have only done 1-2 token tests. Agouti (A82S) coat color: This Allele is associated with the Sable coat coloring found on some Jack Russells. It causes the hairs to change colors along its length resulting in a “banded” hair. This is not detrimental - It is simply a color gene some Jack Russell’s carry and can pass on to off-spring. This is easily tested for - Some of our Jack russell’s individual pages list their coat color genes. Extreme Piebald Color Pattern: This pattern consists of a completely or predominantly white dog with small amounts of color on its head and sometimes base of tail. Small body patches may be present too. Sometimes the nose is partly pink. Extreme white can occasionally cause problems when it removes large amounts of pigment from the face and ears. The most common problem is deafness (due to lack of pigment in certain parts of the inner ear, which prevents it from functioning properly), but dogs with exposed unpigmented (pink) skin are also more prone to skin cancer than those with more pigment. Currently there is not a test for this gene but Science tells us the Jack Russell Terriers as well as roughly 8-10 other breeds carry it. D Locus-Dilution: Color Dilution Gene: Some breeders describe this color as "blue, gray or steel". The diluted coat color gene can be tested for. We test our dogs for this gene because it can cause health issues. Both Dam and Sire must be carriers to pass the gene on to their off-spring. We would take care not to breed two dogs with this gene because a puppy with dilute coat color can have more sensitive skin and/or be deaf. This is easily tested for - Some of our English Jack russell Terriers individual pages list their coat color genes. Melanistic Mask: It is a black mask in which the hairs on the muzzle, and frequently further up the face and into the ears, carry dark pigment. It is normal for a melanistic mask to become gray in an aging dog. This is not detrimental - It is simply a color gene some Jack Russell’s carry and can pass on to off-spring. This is easily tested for - Some of our Jack russell's individual pages list their coat color genes. 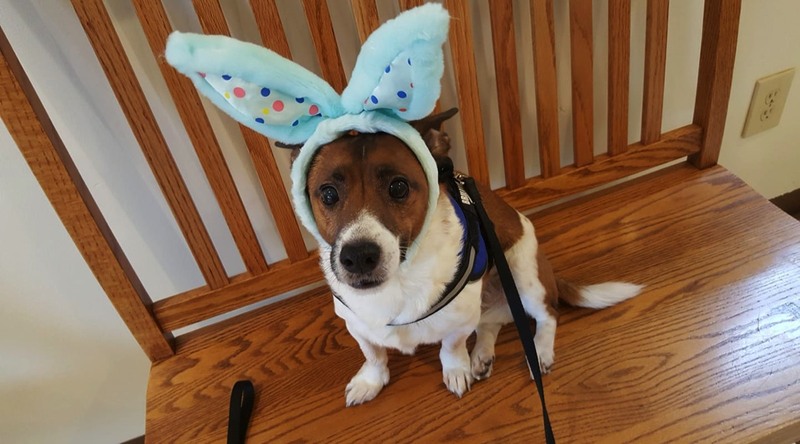 "Casey" dressed up as a bunny and waiting to see his veterinarian in Ohio. He is the cutest jack russell with one of the most luxurious smooth coats. This puppy is a Kylemore Terrier from Massachusetts. The sire is Tadhg. 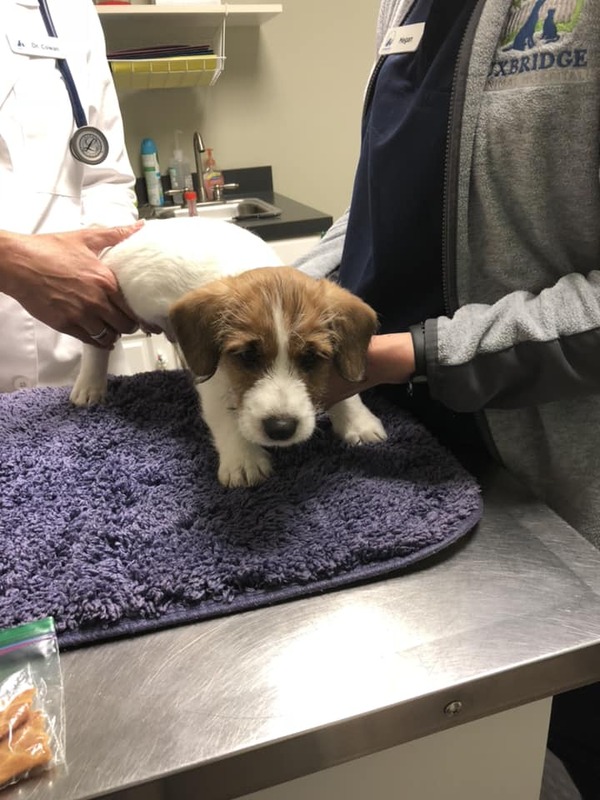 "Maggie" a Connemara jack russell terrier getting special treatment from her Ohio Veterinarian.